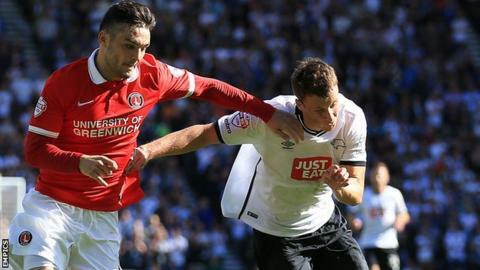 Chris Martin's goal earned Derby County a second Championship draw in two games under new boss Paul Clement and ended Charlton's 100% record this season. The Rams created numerous first-half chances, with Martin and Jeff Hendrick wasteful in front of goal. But the Addicks took the lead after the break when Tony Watt's deflected 20-yard shot beat goalkeeper Scott Carson. Martin's low strike made it 1-1 and Derby were on top in a frantic finish but they could not find a winner. Martin almost earned Clement a first victory with a stoppage-time header, but goalkeeper Nick Pope tipped his attempt over the bar. The Rams were much improved from the midweek League Cup defeat by Portsmouth, with George Thorne and 19-year-old Jamie Hanson seizing control of the midfield in the first period. Johnny Russell and Hendrick both had a couple of chances, but the best chance fell to Martin, who scuffed a shot wide after great work by Hanson and Tom Ince. Charlton, who beat QPR on the opening day of the season, showed limited ambition and struggled to get out of their half, although Cristian Ceballos threatened at either end of the half. But within three minutes of the restart, they led when no one closed down Watt and his strike deflected past goalkeeper Carson for his third goal in three games. Martin's 49th Rams goal levelled matters but, although Clement's side were the more threatening as the game opened up, they had to settle for a point. Derby County boss Paul Clement: "I'm disappointed not to take all three points because I thought we created enough chances and controlled enough of the possession to deserve a little bit more. "Collectively we looked sound and could have come away with a winner in the last minute, but I am pleased with the way we played and there's lots to build on there. "I think we will play worse this season and win, I'm sure of it, but if we keep playing like that, we are going to be fine. The players showed they have got character and personality and I was pleased with them." Charlton Athletic manager Guy Luzon: "Six months ago we played here and didn't touch the ball and Derby scored two goals in the first 30 minutes and we were out of the game. "So it was very important for me that we showed progress and that we are developing as a team. I think we showed a lot of quality and organisation in the defensive side. "I think Derby have a lot of quality, so for us it was a great challenge to come here and show character. I know that maybe we don't have the biggest squad in this league and don't have the budget of Derby and some of the other clubs, but although we have a small budget, we have big hearts." Match ends, Derby County 1, Charlton Athletic 1. Second Half ends, Derby County 1, Charlton Athletic 1. Corner, Derby County. Conceded by Chris Solly. Corner, Derby County. Conceded by Johnnie Jackson. Corner, Derby County. Conceded by Nick Pope. Attempt saved. Chris Martin (Derby County) header from the centre of the box is saved in the top centre of the goal. Assisted by Cyrus Christie with a cross. Attempt blocked. George Thorne (Derby County) right footed shot from outside the box is blocked. Assisted by Jeff Hendrick. Substitution, Charlton Athletic. El-Hadji Ba replaces Johann Berg Gudmundsson. Substitution, Charlton Athletic. Johnnie Jackson replaces Simon Makienok. Substitution, Derby County. Cyrus Christie replaces Jamie Hanson. Attempt missed. Andreas Weimann (Derby County) right footed shot from the centre of the box misses to the right. Assisted by Craig Forsyth with a cross. Attempt missed. Tom Ince (Derby County) left footed shot from outside the box is high and wide to the right from a direct free kick. Ahmed Kashi (Charlton Athletic) is shown the yellow card for a bad foul. Jamie Hanson (Derby County) wins a free kick in the attacking half. Corner, Derby County. Conceded by Patrick Bauer. Attempt blocked. George Thorne (Derby County) right footed shot from outside the box is blocked. Attempt missed. Chris Martin (Derby County) header from the centre of the box misses to the right. Assisted by Craig Forsyth with a cross. Attempt missed. Johann Berg Gudmundsson (Charlton Athletic) left footed shot from outside the box is close, but misses the top left corner. Assisted by Tony Watt. Corner, Derby County. Conceded by Alou Diarra. Attempt blocked. George Thorne (Derby County) right footed shot from outside the box is blocked. Assisted by Chris Baird. Attempt saved. Tom Ince (Derby County) left footed shot from outside the box is saved in the top right corner. Attempt saved. George Thorne (Derby County) right footed shot from outside the box is saved in the top left corner. Attempt missed. Simon Makienok (Charlton Athletic) header from the centre of the box is just a bit too high. Assisted by Johann Berg Gudmundsson with a cross following a corner. Corner, Charlton Athletic. Conceded by Andreas Weimann. Goal! Derby County 1, Charlton Athletic 1. Chris Martin (Derby County) left footed shot from the centre of the box to the bottom left corner. Assisted by Jamie Hanson following a set piece situation. Attempt missed. George Thorne (Derby County) right footed shot from outside the box misses to the left. Assisted by Jeff Hendrick. Attempt saved. Simon Makienok (Charlton Athletic) right footed shot from outside the box is saved in the centre of the goal. Assisted by Tony Watt. Attempt blocked. Tom Ince (Derby County) right footed shot from outside the box is blocked. Assisted by Craig Forsyth.